After hand feeding alligator meat to her father, Hushpuppy lovingly stares as he chews his last supper. In Beasts of the Southern Wild, a little girl named Hushpuppy (Quvenzhané Wallis) faces both the physical destruction of her community by a hurricane and the physical deterioration of her father from a fatal illness and triumphs as an independent adolescent. Because food is an integral part of Hushpuppy’s bayou culture, it is used throughout the film to emphasize her progression from a naïve little girl into a wise young woman. As Hushpuppy matures and gains a new perspective on her role as a “little piece of a big big universe,” her relationship with food matures simultaneously. Ultimately, Hushpuppy uses food to prove to her dying father that she is capable of providing sustenance for herself and living without him. In the beginning of the film, Hushpuppy’s relationship with food is mediated through her father, Wink (Dwight Henry). The first shot of Wink shows him tossing a whole chicken on the grill for “feed up time.” He is thereby established as the one person Hushpuppy depends on for survival. He alone is the ultimate provider of sustenance for Hushpuppy, whose mother is absent. By taking on the role of provider, Wink inadvertently nurtures and coddles his daughter by encouraging her dependence on him. However, in all other aspects of his relationship with Hushpuppy, he tries his best not to nurture her dependence. He is physically and verbally harsh with her because he wants her to be like him—independent and resilient. Hushpuppy’s reliance on Wink for food prevents her from becoming the tough, independent daughter he so desperately wants. For example, proof of Hushpuppy’s inability to fend for herself arises when Wink disappears for a few days due to a medical emergency. After Hushpuppy realizes that she will need to find food on her own because her father has disappeared, she mixes some grotesque canned ingredients (including cat food) into a large pot, which she lights on fire with a blowtorch. She then hears her father outside and runs outside to greet him—forgetting that she has left the stove on. In response to learning that her father does not want to see her, Hushpuppy angrily runs back to her kitchen, where the pot of cat food is billowing smoke. Instead of turning the stove’s burners off, she cranks them up, causing an explosive grease fire. She stays in the burning trailer, choosing to hide under a flammable cardboard box and wait for her father to come save her. In this scene, Hushpuppy does not only fail at providing sustenance for herself through cooking, she fails at protecting her own life from danger. Moreover, she purposely fails. All she wants is for her father to attend to her needs and nurture her lovingly—just how she imagines her mother would. By staying in the trailer, she is testing whether or not Wink truly loves her. Hushpuppy is not ready to become independent; she wants to remain reliant on her father. In response to this incident, Wink—knowing that his death is near—realizes that his daughter will not be prepared to take care of herself after he dies. He begins fervently to teach her how to survive off the land of the bayou. He shows her how to grab a catfish from the swamp and kill it with bare hands; however, Hushpuppy is unable to do it. Shortly after, he shows her how to eat a crab without utensils. He calls this method of eating “beasting it.” Hushpuppy initially struggles to beast it, but then succeeds triumphantly. She slowly learns how to feed herself. She also slowly realizes her father is dying. Consequently, her relationship with food changes from one in which she prefers to rely only on her father for her nutrition to one in which she enjoys working alongside him for sustenance. Unfortunately, as Wink’s health quickly deteriorates, he is unable to continue teaching her how to survive off the land. 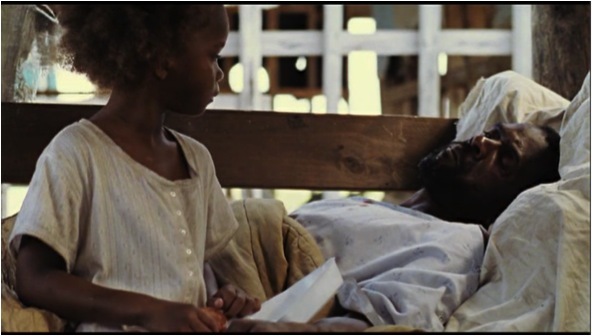 Hushpuppy, refusing to accept that her father is dying, goes to find her mother for help. With her gang of girls, she swims out to sea, and is picked up by a friendly tugboat captain who drops her off on a floating brothel barge. There, Hushpuppy finds a female cook who, based on the stories told by Hushpuppy’s father, is assumed to be her mother. The graceful cook makes Hushpuppy some fried alligator meat, which is the same food Hushpuppy’s mother fed her father before she was conceived. She tells Hushpuppy that she is going to have to learn how to live on her own someday and then proceeds to dance with Hushpuppy in her arms. Hushpuppy, impressed by the woman’s cooking and coddling nature, asks the cook if she will come take care of her and her daddy. The woman tells Hushpuppy no because she can only take care of herself, but also whispers to Hushpuppy that she can stay if she wants to. Faced with everything she thought she wanted—someone to nurture and feed her—Hushpuppy declines the cook’s invitation to stay. Instead of taking the easy way out, Hushpuppy chooses to trudge the harder path, the path of self-reliance. She realizes that her father needs her, that she is ready to face his death, and that she will be able to take care of herself. Hushpuppy therefore returns home with extra alligator meat in tow, and sits on her father’s deathbed. The food that was originally fed to Wink by Hushpuppy’s mother is now handfed to him by Hushpuppy herself. Life has come full circle. Wink’s relationship with food is now mediated through his daughter, just as her relationship with food had been mediated through him. Understanding that his job is done—that his daughter can survive without him—Wink slowly chews his last supper while Hushpuppy lays on his chest, and passes onto the next life. Through skills gained while seeking food, Hushpuppy has finally become tough and resilient. She is no longer the one being provided for. Nor is she just providing for herself. She has exceeded her father’s expectations; she has become a provider for others.